DOT announced today that it will adjust the curbside parking rules on Nostrand Avenue in Flatbush, where B44 Select Bus Service launched in November 2013. The agency plans to replace some commercial loading zones with metered parking along the half-mile stretch of Nostrand between Empire Boulevard and Parkside Avenue. DOT says the changes, which merchants asked for, won’t lead to more bus lane blocking on the B44 route. When DOT puts down new bus lanes or protected bike lanes on commercial streets, the city’s curbside parking dysfunction gets thrown into sharp relief. Double-parking that previously went more or less unnoticed becomes a more visible problem, for example, when it blocks a bus lane. The success of these projects depends in no small part on getting the parking policy right. In this case, DOT took some steps to reduce illegal parking as part of the bus lane project. Before SBS launched on Nostrand, most of these blocks had free curbside parking with time limits. DOT added meters and loading zones in an effort to reduce illegal parking by shoppers and delivery vehicles. But since then local merchants have said the balance is out of whack — they wanted more metered parking and fewer loading zones. After conducting a months-long study using time-lapse video to analyze curb activity, DOT agreed that there were a number of underutilized loading zones along the corridor. The agency will replace that curb space with metered parking. DOT does not expect the changes to affect the rate of parking violations in the bus lane. 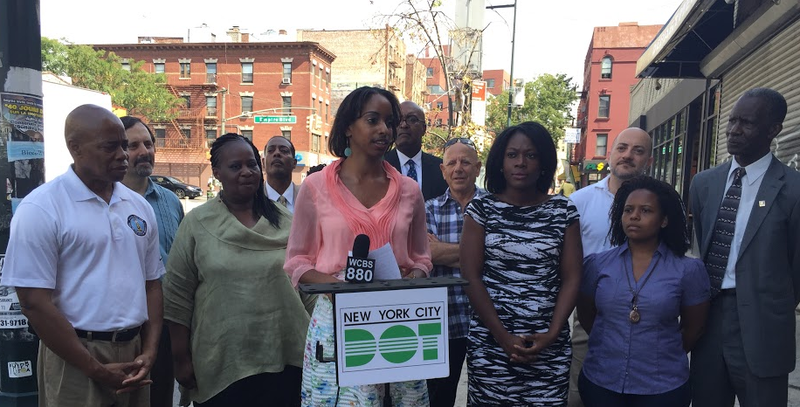 Members of the Nostrand Avenue Merchants Association group joined Brooklyn Borough President Eric Adams, Assembly Member Diana Richardson, and DOT Brooklyn Borough Commissioner Keith Bray at a press conference this morning to announce the changes. B44 SBS has led to a 15 to 30 percent increase in bus speeds along the route, according to a recent DOT report [PDF]. The greatest gains in travel time where made in the areas that received dedicated bus lanes, including the 10-block corridor where parking regulations are being adjusted. While the Nostrand Avenue Merchants Association initially opposed the project, it came around to the idea before the service launched. She hopes to pursue more initiatives like the discounts Nostrand merchants offered to shoppers when the B44 SBS first launched. During the 2013 holiday season, Nostrand business provided markdowns for customers who showed their SBS ticket receipts. This is precisely the problem and perhaps the #1 reason why unprotected bike lanes are useless in NYC. It also explains a lot of the pushback from projects that would narrows lanes. Too often, though, DOT resorts to accommodating double parking with wide parking lanes, instead of actually rationalizing curb regulations so they make sense. Don’t these buses have cameras? Shouldn’t these double parkers be receiving fines? I personally never block bus lanes. Not only because I am considerate of others, but because I don’t want a fine. By this point I would think that most drivers within the the city understand this system. Perhaps we need to raise the fine, what is it at this point anyway? Or is it that bus drivers are failing to ticket these double parked vehicles? How many tickets are these buses dealing every month anyway? I would think thousands.